Finally, with all the preliminaries out of the way, we are finally ready to descend into the real machinations of eBook creation, but since we will be working with HTML for the next few chapters, let me explain some of the basics first. I will keep this very short because ultimately it is not all that relevant to creating eBooks but it certainly helps understand why things work the way they do. I’m an inquiring mind by nature and I always feel more comfortable doing things when I fully understand what is going on under the hood, and why. It is the reason why I always loved machine code programming because it truly lets you get down to the wire… but I’m straying. When working with HTML there are two basic layers of information that you need to be aware of because they need to be kept separate for best results. The first layer deals with the structure of the information in an HTML document while the second one deals with its visual presentation. The second layer, the one that is responsible for the visual representation, then takes that structural information and determines how it should look like on a screen, whether you chapter title is in bold typeface, for example, and whether it should be somewhat enlarged, perhaps. It is in charge of creating proper page breaks, indentations and line feeds, as well as possibly margins around your text. It will determine exactly how to place the images embedded in the text, whether text should flow around them or if they should be centered on the page, breaking up the text flow. All these things that are responsible for how your book will look like are handled by this second layer. As you will learn, the separation of these two layers is crucial because not only will it create in more robust HTML files, it will also make your life a lot easier. HTML is a basic mark-up language that allows you to insert certain information into text to give it certain properties. All HTML tags are bracketed by < and > signs. One of the easiest ways to understand this is perhaps the following example. Naturally, we will also need to tell the display when to switch back to the regular typeface, and we can simply do that by inserting a </strong> tag. It is like a toggle. Turn bold typeface on… write… turn bold typeface off. Most of HTML works this way, as you will see. An opening tag starts an action, a closing tag ends it. Look at the following example and I am sure you will understand what it does as soon as I tell you that the <em> tag means “emphasize,” which in HTML is equivalent with italic. Let’s try something a little harder. Make this more interesting, so to speak. One of the major elements of a book are paragraphs. A number of sentences that we bunched together and that we usually want to appears as some kind of unified block. The best way to tell HTML that it is dealing with a paragraph is by using the <p> tag. Note the opening <p> and the closing </p> tags that tell the display device exactly where we are beginning and ending our paragraph. With this knowledge, we can later tell the device exactly how we want it to treat and display these paragraphs. Another very important HTML tag that you will most likely come across when building eBooks is <img>, used to embed an image in a document. Its use looks something like this. In addition always make sure to close the tag properly with the slash at the end, like such “/>”. eBook readers are very picky about these small details, so make sure you do it right the first time around and turn it into a habit. For the most part, these are the key tags we will be using to build our eBooks. While there are many other tags in the HTML vocabulary, from my experience, the ones I just showed you are pretty much the core of what you will need. For certain, more specific tasks you might have to make use of others, but I prefer to introduce and tell you about those as we get to them over the course of this series. It will be easier to understand and memorize them when you see them within their proper context and in actual use. For now this will suffice and as you can see, this has been very easy and straight-forward, has it not? Like I said, easy as burning a marshmallow over an open fire. In the next installment of the series we will begin to take a closer look at the second layer of HTML where I will show you how to affect the actual look and layout of the text elements we discussed above. Something happened this Christmas that I did not see coming. I upgraded myself to a Kindle 3. I have been a first-generation Kindle user for a long time now and have never had the feeling that my Kindle was lacking in any department. As a matter of fact, for the longest time I told myself that I do not need a new Kindle. I had been playing with the thought when first the Kindle 3 came out and news about the impressive new display made its rounds through the Internet. The temptation was there, clearly, but more from a geeky gadgeteer standpoint than from actual need. I take quite some pride in the fact that I do have my spending habits firmly under control. I do not give in easy to little cravings or desires, and usually get to the point very quickly where I can walk away from things and tell myself that I simply do not need them. To me there is a very clear distinction between the things I want and things I need. Yeah, well, all that changed, of course, when I first laid my eyes on the brand new Kindle 3 in person. I had bought one for my niece for Christmas. She is a real bookworm and the stacks of books she had around were always dangerously close to toppling over burying everything and everyone under them. So, my and I decided to give her a Kindle. It would cut down on her physical storage needs and would make it easier on her wallet, too, as eBooks do have a tendency to be cheaper. Many of the books she has in her library – the classics – are available for free in digital form also, making an even better proposition. But I digress. On Christmas morning we unwrapped our presents and with gleaming eyes she took into her heart her Kindle. I could tell she immediately fell in love with it. The idea itself of having a digital book reader as well as all the benefits that come with it. As I showed her the ropes, how to get around the Kindle, download books, open them, create bookmarks, notes and highlights, etc. I had the chance to use that latest-generation Kindle myself, of course. As I said in openings, it was the first direct contact I have had with the device, but the impression it made on me was quite profound. The new Pearl screen is a real beauty. I always felt the original Kindle screen looked a lot like printed paper, but this new, improved display makes the old one look like it was printed on newsprint paper, while the new one is on high end matter paper without ink blotting. I do have a background in the printing industry as some of you may know, and I have a trained eye when it comes to typography, typesetting and printing, so these improvements are dramatic, and they immediately sprang to my eye. Then I tried the text-to-speech feature, which the Kindle 1 does not offer, and thought it was a nice addition. While it still sounds like a robot trying to read with all the wrong inflections and other artifacts of text-to-speech technology, it is not all that bad and may come in handy on occasion. Much improved is also the user interface. It took a bit getting used to for me to find certain things I had gotten very comfortable with, but I found that some thought had been put into it, making many features easier and faster to access. And the, of course, there is the design. It is a slick little device – much slimmer and lighter than my Kindle 1 – and it feels much less bulky. So, to make a long story short, I really liked the Kindle 3 and once we had all unwrapped and explored our presents I went to my computer and ordered a Kindle 3 for myself. Needless to say that I read a lot, and it is a valid investment, but I am honest. I did not need a new Kindle – this time I wanted one. Only this time I decided that the Wifi version would suffice. I may have bought a book from my Kindle on an occasion or two when I wasn’t within reach of a Wifi network, and the 3G connectivity came in very handy, but as I placed my order I had to ask myself if this luxury was really worth an extra outlay of $50 dollars. I mean, the end of a book doesn’t exactly sneak up on you. You see in your progress bar, how much is left, and to me that simply meant that I should be able to make sure I have the next book ready and loaded by the time I may – coincidentally – be without a Wifi connection AND the need for a new book. So, all I have to do now is to wait for another day to find the new device on my doorstep and load all my books on it. And now I can even start categorizing them… something the original Kindle didn’t allow me to do, and I am sure there will be many more pleasant features I will come to enjoy. As we head into Christmas and the New Year at a rapid pace, I thought I’d let you guys know about some of the book highlights I’ve encountered this year. Since I’ve been writing and publishing my own books I found that I am reading books with much more awareness,enjoying their writing, style and structure much more than before. At the same time, it also makes you take notice of weaknesses much more — but that’s not for today. I have just completed Scott Nicholson’s “The Red Church” and it has instantly turned me into one of his fans. Very similar in style to Stephen King’s writing, this book is pretty amazing on many levels, the premier of which, to me, is the fact that Scott Nicholson is actually the better Stephen King. I have lost interest in King almost 20 years ago for one simple reason. His endless rambling and the fact that every one of his books was bloated to some 1,000 pages when the story could have easily been told in half of that. Contrary to its title, “Insomnia” was a sleeping pill, and books like “The Stand” and others were really boring me to death. So I stopped reading Stephen King altogether and turned towards other writers at the time. Scott Nicholson picks up where I wanted King to be. A colorful storyteller who tells a story with marvelous eloquence and characters that are as deep as they are engrossing and conflicted, Nicholson is definitely on par with King in the narrative sense. However, where Nicholson pulls ahead and easily exceeds King is in the fact that he stays on top and does not stray into the ocean of boredom. He drives his plot forward constantly, making background information relevant and interesting at the same time. I already have plans to read his book “As I Die Lying” some time soon. “The Kult,” by the way is also a cool, though extremely gritty, read. Not for the feeble, I should say, as the violence in the book can be quite disturbing. Think David Fincher’s “Se7en” combined with the “Saw” movies. Vicki Tyley was this year’s greatest find, perhaps, as I have read four of her novels this year alone. She is a first-class crime thriller writer from Australia who is undoubtedly on the brink of breaking into the big time very soon. Her stories are riveting and filled with endless unexpected twists. I got my predictions wrong in every one of her books all the time, and that should tell you something. To give her books a try, check out “Thin Blood” or “Brittle Shadows,” for a slightly darker read. Unfortunately, her best book to date, “Bitter Nothings” has not yet been published, though I did enjoy the pleasure of reading an advance copy she gave me. I also re-read Barbara Hambly’s gothic vampire story “Those Who Hunt the Night” this year. I had read the book some 20 years ago and remembered enjoying it quite a bit. Because it wasn’t available for the Kindle I bought a used copy and dove right in. While a bit wordy at times, the book has an incredible flair, a rich atmosphere and believable characters. It is really a classic that you should check out some time. Then there was David Liss’ intriguing tale about mischievous plotting in the East India Company in his book “The Devil’s Company.” The story gripped me right away as it set itself up as a cool mystery that ended up filled with plots. The real strength of the book was the main character, however, who was struggling to free himself of the evil stranglehold of different parties, each of which put increasing pressure on him and the life of those around him. The book was again a surprise find that I discovered while browsing the shelves at Borders and the cover somehow sprang out at me as a period book. In the end it turned out to be a gem and one great piece of historical fiction. After having spent a lot of time in my last installment, telling you how you should not create an eBook, I will no longer hold you back with explanations of Wrong and instead we will point our heads forward and look down the road of Right. Let’s start with a quick overview over the process I am proposing just so you get a general idea for what you’re going to get yourself into. Depending on your level of expertise this might or might not be all that intimidating at first, but let me assure you that there is no magic involved and every tasked can be performed by virtually anyone familiar with a computer. Remember, the key lies, as so often, in getting the right tools or the job and putting them to work for you. The majority of ebook formats in use today are nothing more than a packaged collection of HTML files. Yes, the same kind of files used to create and display web pages. Surprised? You shouldn’t be. It actually makes a lot of sense. HTML has been created to allow information display on a wide variety of display devices regardless of their capabilities. Whether your computer monitor has a high or a low resolution, whether you are running your browser fullscreen or in a small window, on an old or a new computer, basic HTML pages will always be able to display properly in all these environments. Since we don’t know what device or software the reader will use when they want to display our eBooks, it only makes sense to utilize a format that is tweaked for that very purpose, doesn’t it? A format that has free text reflow capabilities and can easily embed images and other media. You might recall how I told you that you can actually embed video in your eBooks if you want to, and now you know, why. Among recording musicians we have a saying that is very suitable for our cause: Garbage in, garbage out! It means that when the source you are recording is garbage, your end result will inevitably be garbage also. There is just no way to make a bad source signal good. The synthesized vocals of current-generation pop stars are living proof of that. Since we know that our end result is going to be an HTML file, the best way to avoid garbage along the way is to choose a source format that is as close to the output format as possible. So, if the output is HTML, why not make the source format HTML also? HTML is a very simple markup language that is so basic and, more importantly, widely document today that anyone can pick up the basics in under 30 minutes. In fact, many of you may already be familiar with the general basics of mark-up languages from styling their message board posts or maybe even creating their own web pages and blog posts. To put it very bluntly. If we create an HTML file as the source for our eBooks, the end result will be every bit as reliable as the HTML file we initially created. Makes sense, doesn’t it? And that is really all there is to it. That is the secret to creating professionally-looking eBooks. You take the contents of your book and prepare them as a first rate HTML file and run it through a packaging software to prepare the final eBook for you. Yes, it really is THAT simple! I would be remiss, however, to leave things at that. I promised to show you exactly how to do it, and I will. To make sure you are not getting stressed out at this point, let me repeat our key mantra once again. The right tools are critical for an easy workflow. Get the right tools for the job and you’ll be pitching a home run in no time. You will be a much happier human being and you will have much more time on your hands to enjoy other things in life. 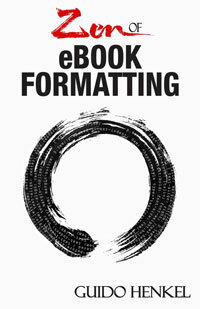 With that in mind, let me run you through some of the basic tools we will peruse in the next installments; tools that will help us achieve the perfect eBook formatting we so desire. I don’t know about you, but I’m a Mac-head. I have long ago decided that my time is too precious to waste on computers and operating systems that don’t work properly and turn into utter time sinks. As a result, I am an Apple Mac user, plain and simple. As I said. Get the right tool for the job. While I highly recommend you should use a Mac also – you will see you productivity go through the roof for one thing, I promise – this does not mean that you really need one. Everything we do on the following pages can be done on a Windows computer also, so do not worry. At this point, let us assume that you have completed the manuscript for your book and have it entirely committed to a single word processor document. Needless to say, you will need a basic word processor to open, read and massage the file, but once again, I assume that as a writer, you do have that. What you will also need, ideally, is a software called a Programming Editor. I use personally TextMate (http://macromates.com), but there are numerous other editors available on the internet also, which will serve the purpose just fine, some of them as paid software, others for free. JEdit (http://www.jedit.org), for example is a free programming editor that is available for Windows, Mac and Linux platforms and will definitely do you nicely. In addition we will be using Calibre (http://calibre-ebook.com) for our final creation of the most common eBook formats. Calibre is a free software package that works under Windows and on the Mac. In the next installment we will take a closer look at some of the features of HTML that we will need to whip our eBooks into shape and how they impact how we will create our eBook source file. Apple has just released a new version (v1.2) of iBooks for the iPad and the iPhone. Usually this is not something I would care much about, but Apple has added one feature in particular that stands out in my mind – hyphenation. As an author I have constantly been surprised that none of the eBook readers in the market seems to support proper hyphenation, not even the HTML-implemented soft hyphenation. By adding this feature, finally, Apple is putting the pressure on Amazon and other eBook readers, and deservedly so, taking the text display on those devices – the thing they are actually optimized for one would think – out of the middle ages. Hyphenation in text is an important typographic feature, not only for justified text blocks, but also for regular left justified reading. There is a reason why hyphenation has been made an integral part of our language’s punctuation language rules. It can actually increase readability while also serving aesthetic purposes. I could understand that Amazon and other eBook manufacturers might not have wanted to include full hyphenation in their devices because the dictionaries necessary to do so might have bloated the firmware, while the actual look-up might have slowed down the page display. Therefore I checked at some point to see if they would at least support soft hyphenation,as it is implemented in the HTML standard. Few people know that HTML actually contains an entity character called &shy; which makes a hyphenation suggestion for the renderer. If you write a word like ten&shy;den&shy;cy in your HTML code, a fully implemented HTML-renderer uses these &shy; characters to correctly hyphenate the word. It means these characters are invisible, unless a word wrap is in order, at which time the renderer will treat the &shy; characters as guidelines to display something like tenden- cy, for example. It is an HTML feature that is incredibly helpful but barely used. The Kindle, sadly failed my soft hyphenation tests, and my understanding is that until today so have all other eBook readers. By including hyphenation – and with it, I expect soft-hyphenation – Apple has once again proven that they are just a bit ahead of everyone else. While this is, of course, a feature that should have been included in all eBook readers from day one, at least we can now expect the implementation of the feature to trickle down other systems as time goes on. I want my iPad orientation lock switch back! Most people know me as a fan of Apple products, a real Mac-head, so to speak. The reason for that is that traditionally I can find very little flaw in the products the company offers, their approach to the user experience and the general approach to the marketplace. That does not mean the company is beyond reproach, of course, and whenever I see flaws I will gladly point them out. And such is with the recent update of the iPad firmware, in which Apple has abandoned the orientation toggle switch. Its functionality has been instead replaced with audio mute. I am not sure why anyone would have ever thought a mute button would be more essential in a tablet than a lock for the orientation. To me it makes no sense and why Steve Jobs would so vehemently state that the lock button will never return is beyond me. As a writer I use Pages for the iPad a lot. I use it to edit and revise my books and even to actually write parts of my stories on occasion. The iPad’s mobility allows me to work anywhere I want to. It also means I am getting interrupted a lot and have to put the tablet down. Unfortunately this means that the tablet may change the orientation because of the movement, which wouldn’t be so bad, but it also reset the zoom factor once I rotate it back to my portrait writing position. Usually this means that my text is too small and I will have to pinch it up over and over again, which really getting tedious after the tenth time. The orientation lock toggle solved this problem, for me. It would lock the orientation and with it my magnification setting in place. The same is essentially true when surfing the web. So for me that toggle was a real asset. Now as for replacing it with an audio mute instead… Off the top of my head I can’t even think of any real application for that. The iPad is not a phone that needs to be silenced quickly in various environments. So what do you need a mute switch for? Gaming, perhaps? What is there that pressing the volume down key a few times couldn’t do? I’m not sure if any mobile game is so demanding on the player that turning the volume down would destroy the experience, particularly as it something you would most likely do once when you start playing. So, what would anyone need the audio mute for, really? Neither videos nor web browsing warrant or require a mute button, so I am truly flabbergasted at how Apple cold have come to the consensus that the orientation lock meeds to go. It is one of the few cases were usability has been sacrificed by the company that practically defines usability in the market – in the world. At the very least one would have expected to find a toggle in the system settings that let users allow what they want their toggle to do for them, but no such,luck. You can still lock the orientation on the iPad, but it requires a bit of fiddling. First press the “Home” button twice and a menu bar will appear at the bottom of the screen. Now swipe the bar to the right and a new menu appears. In the left hand corner you will now find a soft toggle which allows you to lock and unlock the screen orientation. Why this has to be so well hidden and tedious to use, I really don’t know, when an option setting in the system preferences could have pleased everyone. When I visit message boards for authors on the the Internet I keep coming across the same question over and over again, followed by what is effectively the same advice over and again. Sadly, in my opinion, the recommendations are all too often ill-advised and tend to create more problems than they solve. To me, these responses are usually not real advice. They are opinions. Someone suggests the procedure because it worked for them, completely ignoring the fact that their own eBooks resulting from said procedure are oftentimes riddled with problems and/or that the way to get there was resembling running a gauntlet of cumbersome obstacles and tests of patience. Advice, on the other hand gives you the opportunity to make an educated decision based on the evaluation of information. So, let me give you a piece of advice. Do not use a word processor file as the source of an eBook. As you will see in a moment, word processors are not very good at what eBooks do and are therefore the wrong tool for the job. It’s like trying to hand someone a spoon to dig out a swimming pool. It is certainly possible, but at what price? In life, the proper tools will always make your life easier, because tools are designed for a specific task. They will perform this particular task better than any other tool and should therefore always be your first choice. You would never use a blender to mix waffle batter, yet that is exactly what many authors are doing when they try to create eBooks straight out of a word processor document. I can already hear you, getting all giddy with the question why I suppose a word processor is the wrong tool, and I think it is time for me to finally answer that question. Word processors have been designed to enable writers. They are the replacement of the typewriter — in case you still remember those. Their goal is to make it possible for people to write text as cleanly and efficiently as possible, allowing them to simply dump their thoughts onto a computerized sheet of paper. In order to make this as easy as possible, word processing software puts a number of additional tools at the writer’s disposal which come in very handy and will help to keep writers focused on the task. Which brings us to the next problem with word processors. Year after year they have encroached upon the Desktop Publishing Space. It started with simple WYSIWYG attempts and today virtually all word processors in the market pretend to be able to do full page layout. I say “pretend” because despite thinking of themselves as being the jack of all trades, the DTP features in word processors are usually completely worthless. Problems ranging from ridiculous sixteen linked-up textbox limits to unpredictable text flow behavior and errors, make them pretenders in the truest sense of the word, rather than contenders. I am rambling, I know. So why am I telling you all this? To put it simply, because these days word processors try to do too much and obscure too much as a result. From the point of view of a book editor, that is. All these fancy WYSIWYG text layout features are useless if they can’t be properly converted into eBooks and that, in fact, is the crux of the matter. Word processors are almost by definition inept in handling text output that needs to be formatted for variable text flow — a feature crucial to a good eBook. The problem here is in the detail, however. What you don’t see is what will run you to the edge of madness when the time comes to create an eBook. The first line created the indentation using a tabulation character, the one generated when you hit the TAB key, while the second paragraph achieved its indentation by inserting a series of white spaces, blanks. The third paragraph on the other hand achieved the same goal by using a style formatting, telling the word processor to automatically indent the first line in every paragraph by a certain amount without requiring any characters. Three very different approaches to achieving the same thing. Make a mental note, if you will, which one you think is the best way to achieve first-line indentation. We will talk about it in a bit more detail later on in the series. This is but a small exploration of the problems inherent in that little screenshot. If you look at the extra line spacing, you are looking at another ugly beast rearing its head when the time comes to create an eBook. The first paragraph has been set apart from the second using an extra line feed character — inserted by pressing the Enter or Return key on your keyboard. To set apart the second from the third paragraph, however, we have once again applied style formatting instead, which tells the software to automatically insert extra line spacing of a certain size after every paragraph. Are you seeing what I am driving at, yet? Since each of these paragraphs has been created differently, there is a very real risk that each of them will look differently once you let the word processor export your text to an eBook. Naturally, the problem can be avoided by using the same way throughout your entire document, but let’s face it, in the real world, very few people are as rigorous and organized that they apply the proper style setting every time they italicize text or want to create an indentation, particularly over the period of time it usually takes to write an entire book. Since we can’t easily see existing formatting errors in the word processor, we are always teetering on the edge of hidden defects using this methodology. I could bore you with countless other examples where things can go horribly wrong, but since you are reading this, I assume you already figured that out yourself and are looking for a better way to do things. As authors in the real world, what we need is a way to create eBooks that produce reliable results, and word processors simply don’t do that. What is needed, is a different approach, and I will tell you more about that in the next installment of the series. To me, one of the key elements that sets apart a professional eBook release from that of an amateur has always been the technical presentation of the book. Sure, anyone can write a document in a word processor, run it through some export tool, use a fully automated conversion utility or peruse the services of an online service, but the sad fact of the matter is that none of these approaches typically results in, what I call, production-level digital books. So, why are people using them? I have spent a lot of time thinking about this and observing how other authors approach their eBook publishing, and the more I examined it, the more I have noticed that there are generally two reasons for it. Don’t get sloppy on the home stretch! It will reflect poorly on your work. If you’re anything like me, an author you’re not familiar with has one shot to prove himself to you. I will never again touch the book of an author who has made a bad impression on me by delivering a broken eBook that is clearly sub-par. I can forgive many things in a book if I so please — stilted language, poor pacing, logical errors, uneven style, even the occasional typo. However, one thing I cannot forgive is poor eBook formatting, particularly if it is to the point that it becomes distracting from the actual reading experience, and sadly I have seen too many of these in recent memory. I started reading books as a form of entertainment 35 years or so ago and to this day I have not once found a printed book that had formatting problems! Every book that goes to print is practically flawless, except for a typo, perhaps, or print issues such as ink blotting or somesuch production-line flaw. However, I have never seen a book where the font size suddenly jumped, where the font face suddenly changed, where indentations were all over the place or where paragraph adjustment switched from justified to left aligned halfway through a paragraph. Since the dawn of eBooks, however, these things have become prevalent, and, what’s more worrisome, is the fact that too many authors this seems to be completely acceptable. To me that notion is ridiculous and disconcerting, and no writer who is worth their salt should ever be caught publishing an eBook that is not equally flawless as the longstanding tradition of print books has dictated. You may frown upon traditional publishing houses and their supposed arrogance all you want, but most indie authors would still do well to take a few lessons from these dinosaurs. Among many other things, at least, they know how to produce and package a product for sale and do not discount professionalism as a sales point at the expense of instant self-gratification. If you are a self-publishing writer and want to be taken seriously, spend a little time getting acquainted what digital eBooks actually are. Learn how they work, how they originated, what they can and cannot do. You might be surprised how many cool features you can actually add to an eBook with the proper background information and some of these capabilities may truly enhance your books. Sure, some of the features are not very useful for most types of books, but, just as an example, did you know that you can actually embed video content in eBooks? The second reason why many authors never take the time to create proper, optimized eBooks is that they are perhaps intimidated by the process. It is a technical process, to be sure, but it is nothing to shy away from or to be afraid of. All it requires is a very basic sense of structure and sequencing, things we’ve all been taught since first grade and that we have down pat. Let’s be realistic, for a moment. This is you, a smart and intelligent person. You have written a book. You have mastered the spelling of millions of words. You have internalized grammar rules and overcome countless stylistic challenges over the course of putting your book together, not to mention that, most likely, you had to plot it all out properly to create a dramatic arc, or to create a stream of conscious that readers can follow. By comparison, creating professionally formatted eBooks is as easy as burning a marshmallow over an open fire. One of the most challenging moments in the writing of a book and its preparation for publication is the creation of the synopsis or flap copy as it is often called also. The reason is easy to understand. It is a short blurb that will make all the difference whether a prospective reader will actually find the book interesting enough to continue and pay for it. Right after the cover the flap copy is easily the most important driver to turn curiosity into an a sale. Publishing houses usually have dedicated copywriters to compose these flap copies for them. These writers are specialists in squeezing a maximum of intrigue out of a few sentences. Make no mistake: copywriting is an art upon which many millions of dollars can hinge. Naturally, when the time comes for me to compose flap copies for my books I always try to spend some extra time on it. While creating the copy for “Terrorlord,” the latest volume in my “Jason Dark” series, I thought I’d put all of my resources to work and ask a few of my closest writer friends to chime in and help me massage the text. Conjured up from the bowels of the abyss by ancient spells, the Terrorlord has only one desire — to open the Seven Gates of Hell and unleash upon mankind a terror beyond imagination. He will do what it takes and kill anyone in his path remorselessly. To save mankind from the horrors they don’t even know is upon them, the Geisterjäger Jason Dark and Siu Lin have to confront the evil darkness themselves and stop the Terrorlord before his reach is growing too far and his powers become unfathomable. I thought it was pretty good but I would soon learn that I clearly made some cardinal mistakes. The first comment was that there was clearly too much hyperbole in the description to the point that it became detrimental. Someone else also suggested that it was lacking depth. What is a Terrorlord, the question arose, and the consent that the description lacked a true emotional hook. I could see all these points and reworked the text to this. Conjured from the bowels of the abyss by ancient magic, the Terrorlord has one desire — to open the Seven Gates of Hell and unleash the horrors of the undead upon mankind and devour our world in his evil blackness. Reliving the nightmares of his youth where an encounter with the Terrorlord left him scarred for life, Jason Dark must once again confront the powerful gatekeeper from Hell before his reach and power spiral out of control. I did not elaborate further on the explanation of the name “Terrorlord” because I really felt that the name was enough to paint a picture, particularly if you take into consideration the cover artwork that would accompany the book. Take a look at the image to the left and judge for yourself. Apart from that, however, I definitely tried to make the synopsis stronger than before and to relay a bit more information – too much information, perhaps. The comments on this one were that the first sentence in particular was too convoluted, running on with too many verbs – opening, unleashing and devouring. Yes, I could see that. It was a bit clumsy, indeed. Complemented with the standard boilerplate second paragraph that provides information regarding the time period and setting of the story, I finally decided to go with the following text. Conjured from the bowels of the abyss by ancient magic, the Terrorlord has one desire — to open the Seven Gates of Hell and unleash the horrors of the undead upon mankind. Reliving the nightmares of his youth where an encounter with the Terrorlord left him scarred for life, Jason Dark must once again confront the powerful gatekeeper from Hell before his reach and power spiral out of control. With the help of Siu Lin, the ghost hunter will have to put an end to the Terrorlord’s dark reign before he can devour our world in his evil blackness. This is the ninth volume in a series of gothic horror adventures where Jason Dark, a fearless and resourceful ghost hunter, follows in the mold of a Sherlock Holmes combined with Randall Garrett’s Lord D’Arcy. Written by Guido Henkel, the designer who brought Germany’s famed “Das Schwarze Auge” series to computer screens, this series is filled with enough mystery, drama and suspenseful action to transport you to the sinister, fogshrouded streets of Victorian England. Your encounter with the extraordinary awaits. As you can see, I hope, creating a powerful flap copy is not as trivial as it may appear at first. Even though I may have ended up with a decent enough synopsis through this process, part of me truly wonders what a professional copywriter would be able to come up with.